Two people have been found dead after a fire at a house on Teesside. Police were called to Beaumont Road in the North Ormesby area of Middlesbrough on Wednesday after concerns were raised for two residents who had not been seen for several days. Officers smelled smoke and called the fire service, which found there had been a blaze in the kitchen which had burnt itself out. 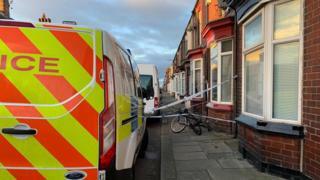 Cleveland Police later said the fire and the deaths were not suspicious. A spokesman said: "Police will now prepare a file for the coroner in regards to the deaths of a man and woman, whose bodies were found inside the property."